A black and white photograph of Oscar John Moore. Oscar John Moore (1906-1983) was born in Whitby on November 27, 1906. Mr. Moore spent several years as a resident of Regina, Saskatchewan where he was married to Eileen Truman on April 30, 1930. He returned to Whitby in 1934 to work at the Ontario Hospital, Whitby. He took leave to serve in the Royal Canadian Medical Corps in World War Two from 1941 to 1946, seeing service during the Blitz in London, England and in hospitals in France, Belgium and Holland. He returned to the Ontario Hospital in 1946 and retired as Supervisor of Cottage 13 in 1969. In later years he was a Court Officer employed by the Ministry of the Attorney General in Whitby. 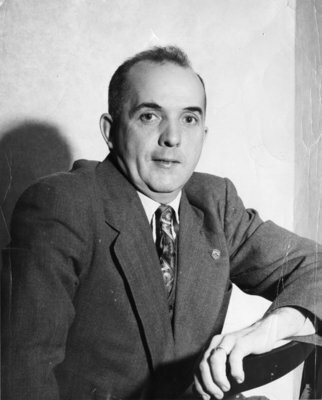 Mr. Moore served on the Whitby Town Council from 1949 to 1954 and on the Whitby Public Utilities Commission from 1956 to 1961. He was a member of the Royal Legion Branch 112, Whitby, Composite Masonic Lodge and St. Mark's United Church. He was also a member of the Whitby Community Arena Board. Oscar Moore died in Whitby on February 18, 1983 and is buried at Groveside Cemetery, Brooklin. Oscar John Moore, November 29, 1948, Marjorie Ruddy. Whitby Archives, 31-005-016.